Scabies is very common and anyone can get it. It should be treated quickly to stop it spreading. Tiny mites lay eggs in the skin, leaving silvery lines with a dot at one end. The rash can appear anywhere, but it often starts between the fingers. Many other things can cause itchy skin and rashes in babies and children. Scabies is not usually a serious condition, but it does need to be treated. A pharmacist will recommend a cream or lotion that you apply over your whole body. It's important to read the instructions carefully. You'll need to repeat the treatment 1 week later. Scabies is very infectious but it can take up to 8 weeks for the rash to appear. Everyone in the household needs to be treated at the same time – even if they don't have symptoms. Anyone you’ve had sexual contact with in the past 8 weeks should also be treated. You or your child can go back to work or school 24 hours after the first treatment. Although the treatment kills the scabies mites quickly the itching can carry on for a few weeks. Scabies are passed from person to person by skin-to-skin contact. You can't get scabies from pets. People who live or work closely together in nurseries, university halls of residence, or nursing homes are more at risk. Anyone can get scabies – it has nothing to do with poor hygiene. Scratching the rash can cause skin infections like impetigo. 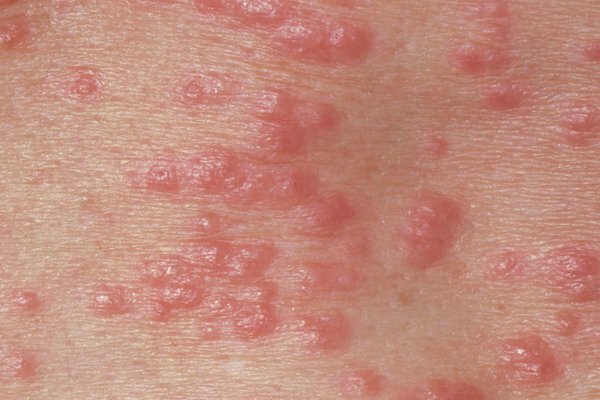 Scabies can make conditions like eczema or psoriasis worse.